Property Size 2,576 sq. ft. Welcome to Kolea 7F ~ Spring Break & Winter Available! 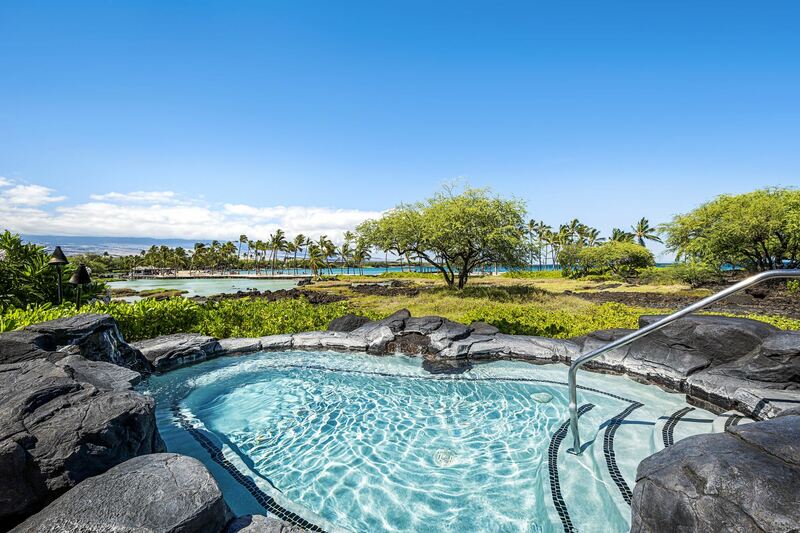 With an ocean view of Anaeho'omalu Bay, and a mountain view of Hualalai, this highly coveted penthouse is now welcoming guests after years of exclusive and private use. Kolea 7F is a 3 bedroom, 3.5 bath just a stone's throw from the Kolea Beach Club. An elevator (that is only shared between two condos) will deliver you to your private entry landing where your African Mahogany double doors open to reveal a picturesque view that will lure guests for years to come! The lush green landscape, the turquoise waters of A Bay, the majestic rise of Hualalai and the tropical skies await your arrival. Tuck the lanai doors completely into their wall pocket to enjoy the outdoor ambience from the Great Room. The living area offers couch seating, arm chairs and a recliner; as well as a work station. A large flat screen tv will compete with the view for your attention. The lanai has a built in Viking grill and beverage center for barbecue gathering. The lanai area is spacious and easily accommodates arm chair seating as well as an outdoor dining table. The gourmet kitchen is fully stocked, simply bring or call in your grocery order and make yourself at home. Bar stool seating at the kitchen island for casual cooking and dining. The island houses a Viking cooktop and wine cooler below dimple pendant lighting. The stainless steel appliances are high end products of Viking and Subzero. The master suite is fit for royalty with a king bed in an ornately designed four post bed, set in a rich dark espresso tone. This luxurious bedroom furnishings is beyond complete as it includes an entry table, large dresser, a love seat bench, entertainment desk and nightstands. The master suite has a walk in closet and private lanai with a fabulous mountain and ocean view, not to mention a view of the Kolea Beach Club and A Bay. The master has dual walk in showers bathed in natural illumination from the high windows and sky lighting. The roman tub sits below a lovely window with a view. and the double vanities are all set in natural stone and African Mahogany. The guest suite is furnished with a softer demure tone, with a queen bed framed in a canopy four post setting. The television is easily hidden from site as it is tucked in the matching armoire. Who can deny the pleasure and extravagance of the spacious walk in closet, along with a massive bath with a walk in shower, sitting bench, deep soaking tub and dual travertine vanities? The third suite has a flat screen samsung television and a bedding configuration that can be converted from a pair of twins to king upon your preference. The private bath for this room has a gorgeous walk in shower with a midway glass enclosure; an unexpected elegant upgrade from the typical hanging shower curtain still found in many of the other Kolea units. This penthouse has a full size washer and dryer, ceiling fans in each room and central air conditioning. Kolea is located in the Waikoloa Beach Resort and enjoys direct beach access to Anaehoomalu Bay! - Summer kitchen on lanai overlooking an unobstructed view of the ocean, complete with barbecue grill, outdoor fridge and sink set in a granite and teak outdoor kitchen. - Kolea Guests Enjoy Discounted Golf Rates at the Waikoloa Kings Course and Waikoloa Beach Course. Made the trip extra special.